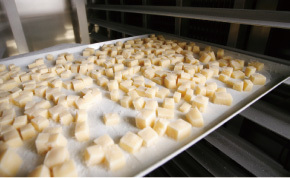 Although the quick-freezing technology has a nearly 100-year history, deterioration of frozen food quality could not be avoided more or less because material cells were destroyed and materials dried or oxidized. The Cell Alive System (CAS) is a technology that generates a special magnetic field around a subject material by using pulsed magnetic field, low-frequency wave and several types of weak energy. By combining this technology with a refrigerating appliance, the water molecules within a material are frozen instantaneously from its super-cooled state to minimize the damage to the cells. Practical use of this technology was started in 2000 and it contributed greatly to the development of the food industry and medical field (storage of internal organs, nerves, blood and teeth). Incidentally, the CAS itself is not a freezing technology. Mr. Ohwada, the developer, intends to introduce this technology into agriculture, livestock raising, dairy industry and fishing industry. 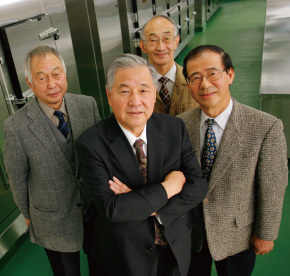 "Mr. Ohwada, We do not use frozen foods not because they are frozen. We cannot serve foods, the cells of which are destroyed, to customers. If their cells are not destroyed, frozen foods are not different from raw foods. Please develop a technology for it." The executive chef of a famous hotel said so and Mr. Ohwada determined to develop a technology for "Cells Alive System (CAS). Several years before, Mr. Ohwada, the founder of ABI Co., Ltd., succeeded in development of a quick freezing device for fresh cream, which was said to be impossible to manufacture at that time. The dielectric freezer, which uses magnetic fields, was so effective that it spread quickly in the confectionery industry. "I thought that our technology for freezing storage of confectionary would keep our business performance good." Mr. Ohwada, however, received a complaint from a teacher of national cooking school in France. "The teacher said, 'Mr. Ohwada, your freezer cannot be used for cooking foodstuffs. Modify your freezer.' The teacher's complaint was pointless because our freezer was produced for confectionery from the very beginning. However, no company cannot survive in the confectionary industry if it rejects a request from France." Reluctantly the company started development of a freezer for cooking foodstuffs. Its staff visited chief cooks of famous hotels and restaurants in Japan for research of foodstuffs. However, all the cooks declined to meet them when they knew that the visitors were the employees of freezer manufacturer, saying, "We use raw foods only". 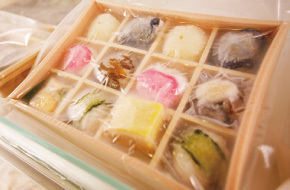 Without knowledge about cooking, they started development, completed a test freezer and froze a food. When a top chef ate the thawed frozen meat, he said, "This taste is that of a raw foodstuff" and gave Mr. Ohwada an advice shown in the beginning. "Food cells are destroyed in freezing because water becomes big ice crystals and destroys the cell membrane and wall while a food is frozen from its exterior to interior. In addition, water is sucked into the clearances among the crystals and so drying and oxidization are caused. Mr. Ohwada thought that the "supercooling" phenomenon of water might be used to solve the problem. Supercooling phenomenon is the state of water, in which water does not freeze even if it is cooled to 0C or below. In that sate, water molecules are kept in a rare static balance, do not get together and do not crystallize. However, even a minor impact is applied, the molecules get together and water freezes quickly. Then they asked themselves, "If water molecules are kept vibrating slightly by weak energy, can water be kept in the sate of liquid even at very low temperature?" Furthermore, they thought that if temperature was lowered further and a proper shock was applied, water might freeze in very small molecules instantaneously. While Mr. Ohwada was busily working for development, he received an unexpected request again. "This time I received a request from a medical doctor. He asked me if my freezing technology could be used for storage of blood and body organs for transplantation and regenerative medicine. He also said that he would bear my development cost because he knew I was poor." Mr. Ohwada produced test devices, which combined a pulsed magnetic field and a low-frequency magnetic field, and lent them to doctors. Doctors were allowed to return those devices freely but were asked to report any part that was better than the previous device. He repeated modification and test of device for use in both medicine and food industry. He obtained reliable empirical values and finally completed a device that could freeze or refrigerate and store "cells alive". "Practical use of our device for foodstuffs was started about ten years ago and that for body organs started about five years ago. I felt very happy when 1kg of CAS tuna was auctioned at 15,000 yen at Tsukiji Market while 1kg of raw tuna was auctioned at 4,000 yen and when an organ supercooled in CAS was successfully transplanted. Conventionally a heart had to be transplanted within maximum 10 to 14 hours after it was extracted. However, if a heart was stored at –30C to –40C in CAS, it could be stored for ten days. I felt relieved because I could fulfill my responsibility to the doctors." 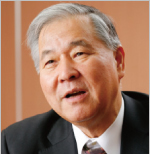 However, some of Japanese scholars had prejudice and criticized Mr. Ohwada. "They said, 'His technology has no theory and he presents no paper in the academic circle. His technology is a fake.' In fact, sometimes I take an action by guesswork and results are most important for me. I cannot understand a theory. Therefore I was often treated by others as if I were a speculator." The CAS technology was also introduced overseas. Many countries showed interest and the CAS technology is now studied in twenty-two countries. One of those countries even asks him to move his headquarters to that country. A foreign scholar said to Mr. Ohwada, "A new thing is always created from nothing and a theory is made later." The University of Tokyo and Chiba University have started a joint research to theorize the CAS technology. In the near future, "science" will prove the correctness of Mr. Ohwada's "guesswork". 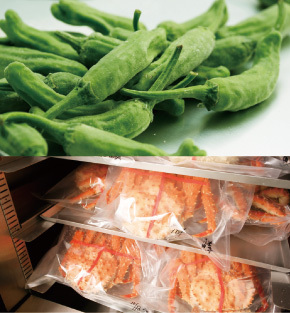 By combining the quick freezing and the CAS, the company developed an innovative technology for freezing and storage of foods. This technology is also used for medical transportation and regeneration medicine in the medical field. Tofu (soybean curd) frozen in CAS. When it is thawed, it becomes as fresh as a new tofu. Quick freezer equipped with the CAS function. Its interior conditions can be always monitored. Frozen shishito, a sweet green pepper, as fresh as raw pepper. Frozen king crabs that look like as if they had just been caught. Frozen perishable foods are stored for one year and then compared with fresh ones to conduct an organoleptic examination. Customers can take out delicious foods from a high-class restaurant thanks to the CSA technology. This activity was performed with subsidies from JKA. The posted contents are based on the information available in 2009 when the awards were given. The Japan machinery Federation　©Copyright2010-2011 Ministry of Ecoromy,Trade and Industry. All Rights Reserved.